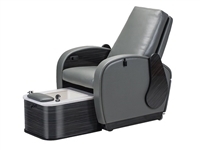 Vantage VE features Full Shiatsu Massage, Fold down side manicure trays with cup holder, Electronic seat movement that reclines and slides, Adjustable tilt footrest, Pipe-free jet technology and a Chemical Resistant Acrylic Basin. Now with standard EZ Clean Magnetic Jets! Upholstery Colors: Almond, Chocolate, Slate, Black. 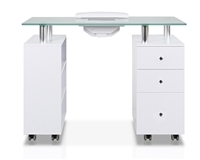 Curved Base options: Natural White, Select Cherry, Espresso Pear, Stainless Steel Laminate. This ventilation system with casters is perfect to have when you need the extra ventilation or can be rolled into storage when you dont. The carbon filter (included) is easy to remove and change. The unit has a fan speed knob so you can determine the amount of fan that is needed. Choice of 4 standard solid surface colors; High Desert, Night Shadow, Crème or Designer White. (Upgraded Avonite options available for an additional charge). Standard in Natural Maple. Can be used for stationary venting through a floor or wall. 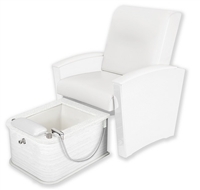 Additional piping and other materials not included for those set ups. Standard with an 8" vent hose.